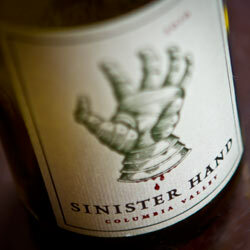 This tasty little nugget was one of the wines we picked up on our Willamette Valley trip. A blend of 71% Grenache, 24% Syrah, 5% Mourvedre all grown in the Columbia Valley it has a rather decent 14.3% alcohol. Owen Roe will give you the whole story about the bloodied hand on the bottle which makes my brother in-law call it “Metallica wine”. Perhaps a bit full in the body for lighter meals, it has strong tannins and is some pleasant drinking, full-flavored drinking. Of course, you really can’t go wrong with any of the Owen Roe family of wines.